Thank you for visiting my website! Here you will find information about my books, events, videos and more. Besides being a non-fiction author writing about local history, legends, ghost tales and historical crimes, I have also co-authored an Italian cookbook, and I have written a novel called, The Medal, which you can read about here. My career, which has spanned over twenty years and eight books, has been an interesting and rewarding journey. Along with writing books, I’m a professional photographer, a local historian, a public speaker, and a food writer. So when I’m not investigating ghosts, or doing research and interviews, I’m eating, and writing about some fantastic restaurants and chefs on Long Island. The diversity of my career makes every day new and exciting. I love interacting with the public, so please contact me with any questions you may have, and be sure to catch me at one of my lectures and book signings. I appreciate you visiting my website, and I hope you will enjoy reading my books. Beyond the idyllic countryside and suburban communities of Long Island lies a murky history of murder and mayhem. A Victorian romance went awry in Huntington when wealthy farmer Charles Kelsey was tarred, feathered and murdered in 1872. Thirty-five years before the famous witch trials of Salem, East Hampton had its own Puritan hysteria among charges of witchcraft. The 1937 kidnapping of wealthy heiress Alice Parsons shook the quiet town of Stony Brook and remains a mystery to this day. 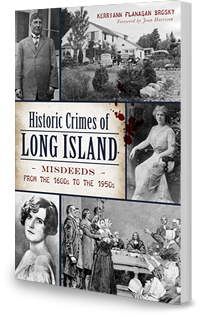 Award-winning author and historian Kerriann Flanagan Brosky uncovers some of the most ghastly and fascinating historical crimes committed on Long Island.